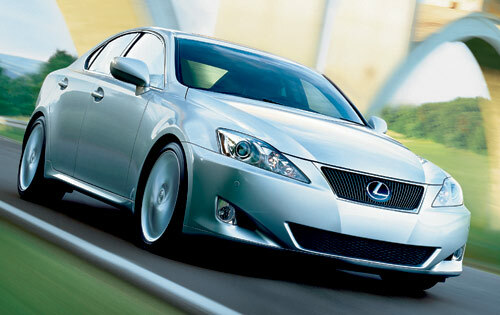 The Lexus IS is a series of entry-level luxury cars / compact executive cars sold by Lexus since 1998. The IS was introduced as an entry-level sport model slotted below the ES in the Lexus lineup (and outside of North America, the Lexus GS). The IS was originally sold under the Toyota Altezza nameplate in Japan (the word "altezza" is Italian for "highness") until the introduction of the Lexus brand and the second generation Lexus IS design in 2006. The Altezza name is still used at times to refer to chromed car taillights like those fitted to the first generation model, known as 'Altezza lights' or 'Lexus-style' lights. The first generation Altezza (codename XE10) was launched in Japan in October 1998, while the Lexus IS 200 (GXE10) made its debut in Europe in 1999 and in North America as the IS 300 (JCE10) in 2000. The first generation, inline-6-powered IS featured sedan and wagon variants. The second generation IS was launched globally in 2006 with V6-powered IS 250 (GSE20) and IS 350 (GSE21) sedan models. A high-performance V8 sedan version, the IS F, premiered in 2007. Hardtop convertible versions, the IS 250 C and IS 350 C, debuted in 2008. According to Lexus, the IS designation stands for Intelligent Sport.